AdvancedMC Processor Module is powered by Intel Core i7 CPU. Equipped with IntelÂ® Hyper-Threading technology, double-width AM5020 offers up to 2.53 GHz dual-core performance to run parallel, multi-threaded applications on MicroTCA platforms. It leverages Intel Core(TM) i7 mobile processor with integrated memory controller, PCIe Gen2 I/O, and Intel HD graphics. Streamlined data paths between CPU, Intel QM 57 platform controller hub, and peripherals optimize performance. Multiple I/O and connectivity options are standard. Eching, Germany - Kontron announced today the introduction of its powerful double-width AdvancedMC processor module AM5020. Equipped with an Intel Core i7 Mobile processor and Intel Hyper-Threading technology, the new Kontron AM5020 can produce an amazing amount of computing power, with up to 2.53 GHz of dual-core performance to run parallel, multi-threaded applications on MicroTCA integrated platforms. The Kontron AdvancedMC processor module AM5020 incorporates the high-performance Intel Core i7 processor with an integrated memory controller, PCI Express Gen2 I/O and Intel HD graphics. 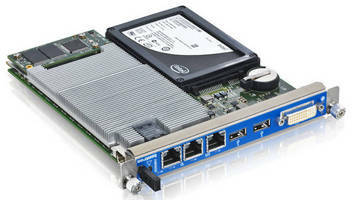 Coupled with the highly integrated Intel QM 57 platform controller hub (PCH), it has a high performance density packed into a small footprint. Using the Kontron AM5020, customers can take advantage of the reduced component count and streamlined data paths between the CPU, PCH and peripherals in a powerful, space-saving and cost-effective design. The Kontron AM5020 is ideal for MicroTCA platforms in telecommunications applications such as IPTV, media servers and media gateways, conference systems, and TETRA switches, as well as applications in medical, automation and security. With its MicroTCA.1 faceplate design for robust system integration, it is capable of withstanding demanding mechanical environmental conditions. With support for PICMG AMC.1/.2/.3 sub-specifications, the Kontron AM5020 ensures a comprehensive set of interconnecting capabilities. Eight PCI Express lanes to the backplane configurable as 2 x PCIe x4 or 8 x PCIe x1, guarantee high throughput for I/O-intensive applications. Four GbE interfaces, two on the front panel and two on the backplane in accordance with AMC.2, provide comprehensive networking capabilities. The Kontron AdvancedMC processor module AM5020 provides an extensive range of mass storage support with six SATA-II channels. Users can choose between an onboard 2.5" SATA drive and/or up to 32 GB of SATA flash memory, which is securely fastened to the PCB. In addition, four SATA channels are routed to the AMC connector (AMC Port 2, 3, 12, and 13), enabling applications with a high amount of storage capacity and RAID. The Kontron AM5020 also features a DVI-D interface at the front combined with two USB interfaces, two GbE and a serial port via RJ45. With this comprehensive set of internal an external I/Os on a single module, the Kontron AM5020 represents a space-saving and cost-effective solution for a broad range of I/O and data intensive applications. The Kontron AM5020 has full hot-swap capabilities for monitoring, controlling and replacing the module. The Intelligent Platform Management Interface (IPMI) enhances the board's availability while reducing the overall operating costs and mean time to repair. A dedicated Module Management Controller (MMC) is used to manage the board and supports basic IPMI commands, which enable operators to monitor the state of the AdvancedMC module in the system. Kontron also offers various MicroTCA platform solutions for the Kontron AdvancedMC processor module AM5020, which can be combined with a rich portfolio of MCH solutions applying to entry-level designs and small-sized systems as well as to high-performing managed switching. Used in conjunction with the Kontron AM5020, these platforms are ideal solutions for multi-processor systems in medical, research and industrial automation applications as well as in communication systems, including government implementations. The mid-size, double-width Kontron AdvancedMC processor board AM5020 is available now. It supports Windows XP, Windows 7, Windows Server 2008, as well as VxWorks 6.8 and Wind River Linux PNE 3.0.2. Intel® and Intel® Core(TM) are trademarks of Intel® Corporation in the U.S. and other countries. PICMG®, AdvancedTCA®, ATCA®, AdvancedMC(TM), and MicroTCA(TM) are trademarks of the PCI Industrial Computers Manufacturers Group. All data is for information purposes only and not guaranteed for legal purposes. Subject to change without notice. Information in this press release has been carefully checked and is believed to be accurate; however, no responsibility is assumed for any inaccuracies.